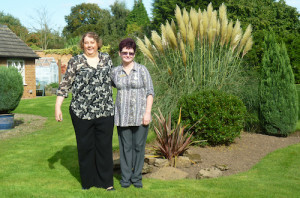 The Registered Manager, Karen Squire has been at the home since March 2013 and has a background in domiciliary and residential services working for Derbyshire Social Services for many years. Deputy Manager Mel Barron has been in her post since November 2012 and has many years of experience, including management expertise in care homes. There are four Senior Care Assistants all of whom have achieved their NVQ level 3 and the Care Assistants are all supported in undertaking their NVQ level 2, although many go on to do their level 3. Training is a high priority at the Home and we have a continuous commitment toward training for all our staff. The staff are supported by a very committed Housekeeping team who maintain the Home’s cleanliness and hygiene to a very high standard. Last but not least, Sandra Wilkinson manages the accounts, wages and day to day running of the home assisting with Human Resources, resident contracts and accounts and liaison with the Local Authority finance department. The Management Committee are all regular visitors to the home and hold monthly meetings. Dave Morgan is the Chair of the Committee and liaises regularly with Karen to discuss the running of the home.